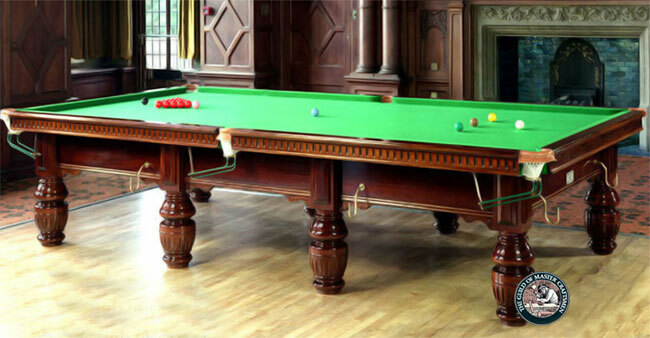 12 ft Birmingham Billiards Classic Royal Snooker Table for sale. Made by Birmingham Billiards England. This nicley proportioned full size solid mahogany snooker table that has recently become available. The table is in very good condition however it will still go through the full process of refurbishment. Table manufactured in Solid Mahogany. All woodwork to be totally stripped back to the bare wood. Any imperfections repaired and the complete table re-polished back to its original state. "It will look fantastic and play as new". New pocket leathers and nets are to be fitted. Cushions and bed cloth to be recovered in 100% English wool napped cloth. 2 x new quality snooker cues, cross rest, long tackle and hangers. Set of snooker balls, triangle and a scoreboard. "Image above courtesy of official Birmingham Billiards web site. This table will be finished to the same dark mahogany factory finish." Free NW England professionally delivered and installed by one of the country's top installers "Sovereign Snooker Services". Other mainland UK usually £100. Refurbishment usually takes around 4 - 6 weeks from an order being placed to installation. Please call or email using contact details below, feel free to ask any questions. If your room is under development, we understand that building works seldom go to plan and will hold the table until you are ready to take delivery. We are not a high volume manufacturer with most of our tables made or refurbished to our customers special instructions. ( we do things the old way ) To place an order a 20% deposit is required either by cheque or bank transfer. Work will start as soon as the deposit funds clear. The balance paid in cash or bank transfer at point of installation and your satisfaction. Please see our "Customer testimonials page for reassurance". Lead time 4 - 6 weeks. Balance of £1960 paid in cash or bank transfer at point of installation and your satisfaction. If you would like to us to hold this snooker table until your snooker room is ready please give us a call or email to reserve. Wool napped cloth (colour of your choice).